Hopper automatically dumps when bumper release contacts side of dumpster. Hopper returns to an upright and locked position automatically after it dumps. Also includes a cable that may be operated from the seat of the fork truck to manually dump the hopper. A locking chain is provided to secure the hopper to the fork truck. Usable fork pockets are 7 1⁄2"W x 21 ⁄2"H. Constructed with durable, consistent robotic welds.V- D-33, V-D-50,V-D-75 and V-D-100 are stackable if you stack the top hopper turned 90° from the bottom. Base fork pockets are 3/16" thick. Powder coat blue finish. We have the ability to customize color - Please call ZORIN (888) 378-6525 for details. 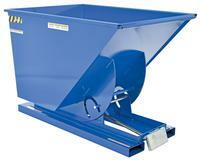 Transport loads with portable hoppers. 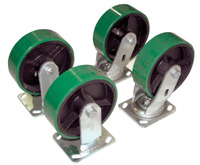 When casters are ordered with hopper, quick-install caster pads are factory-welded to the base of the hopper. 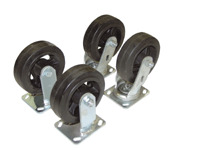 The casters are then shipped uninstalled to prevent freight damage. 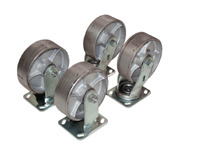 Casters not ordered with the hopper will need to be welded in place by the customer. 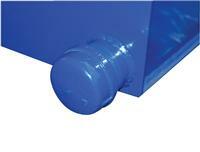 The maximum weight capacity is the lowest weight capacity of either the hopper or the caster. Model V-HOP-SC6-2 - Semi Steel; 6" x 2"; Capacity 4800 lbs. Model V-HOP-SC8-2 - Semi-Steel; 8" x 2"; Capacity 4800 lbs. Model V-HOP-RC6-2 - Mold-On-Rubber; 6" x 2"; Capacity 2400 lbs. Model V-HOP-RC8-2 - Mold-On-Rubber; 8" x 2"; Capacity 2400 lbs. Model V-HOP-PC6-2 - Poly-On-Steel; 6" x 2"; Capacity 4800 lbs. 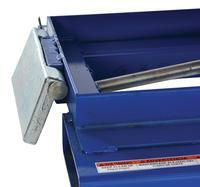 Model V-HOP-PC8-2 - Poly-On-Steel; 8" x 2"; Capacity 4800 lbs. Lids - Please See Heavy-Duty Poly Lids Section or call ZORIN (888) 378-6525.